So, I'm a procrastinator. I've had this darn post mostly written and only needing photo links for the last two weeks. Two weeks isn't TOO long of a wait. Right? 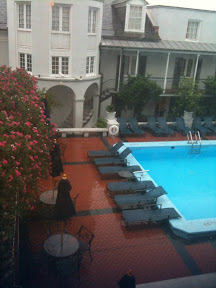 The last full day of AAD started out overcast and rainy. It stormed while I breakfasted with Jen (@Twimom227) before we headed out to a field trip of the Garden District with author Theresa Meyers. I'm so glad I packed my umbrella and new rain boots. We visited Lafeyette Cemetery and walked around the Garden District looking at the historic homes. 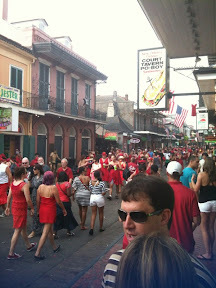 On our return to the hotel, we ran into the crowds showing their support of the Red Dress Run a.k.a. another excuse to party down on Bourbon Street. We returned just in time for the big booksigning. We kicked the evening off at the Samhain reception before splitting up for the evening. Some of us went off to the Author Pub Crawl. 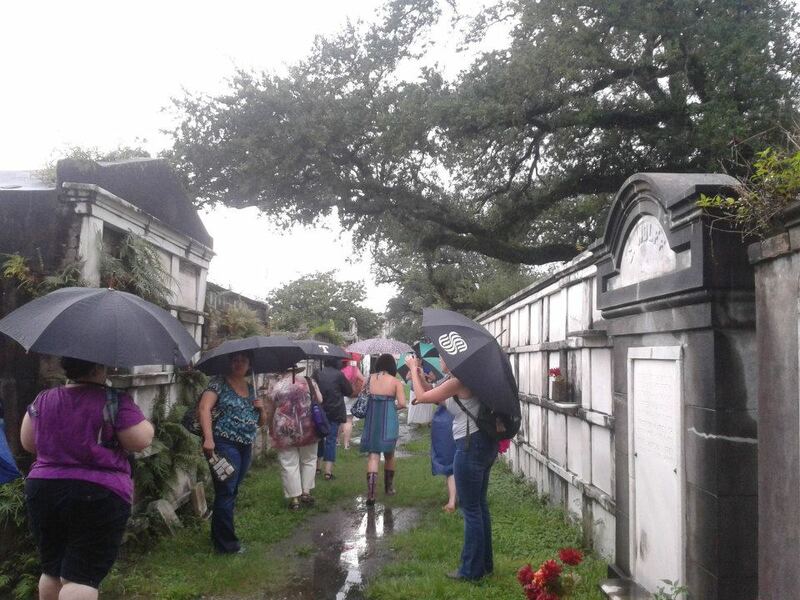 Jennifer and I got into author Adrian Phoenix's tour of Dante's French Quarter. I haven't read her series but it sounded pretty interesting after I heard about the characters and the storyline from the author as we walked around the French Quarter so I'm adding it to my TBR list. 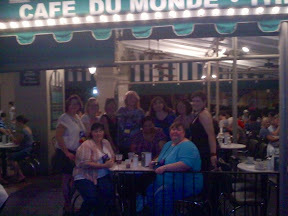 We made stops at Lafitte's Tavern, St. Louis Cathedral, Cafe du Monde, and the Mississippi River. It was a fun way to end my trip of the Big Easy. However, the best part of the trip for me was all the people I met - the bloggers I follow, friends I'd made on Twitter, authors (new and old to me), and new friends I made. I can't wait to decide what reader's convention to go to next year! Here's a video I took showing a bit of what Bourbon Street is like at night. 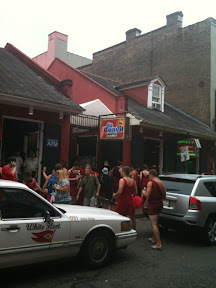 This was filmed on Saturday as we walked from Lafitte's Tavern to St. Peters Street.